My DIY Umbrella Featured on DIYPhotography.net! Is it the highest honor a civilian can receive? Not really, but I still think it’s pretty cool. 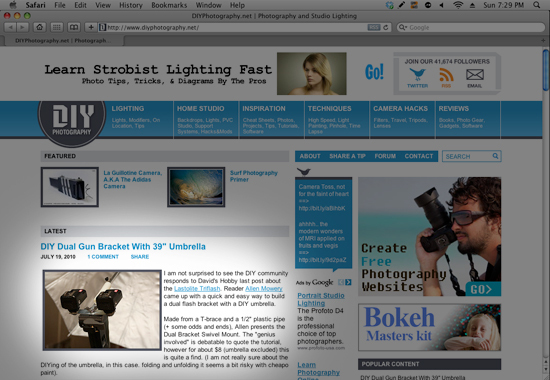 In viewing my Flickr traffic and comments today I discovered that my DIY FrankenFoto reflective umbrella is featured on the home page of DIYPhotography.net! DIYPHotography.net is a place where I have drawn a lot of inspiration and ideas, and it’s also where I have connected with the work of such photographers as “Just Fab”, another great do-it-yourselfer. So, thank you, DIYP, and I am glad to have an opportunity to give back to this frugal and ingenious photography community. Keep up the great work! Home » My DIY Umbrella Featured on DIYPhotography.net!